As pure as the day we were born. We remain true to our original purpose: Help people get more out of life. ZUME was inspired by the puriest ingredients on earth. We created a key visual design to reflect our brand of delicious and wholesome ingredients. Our results are consistent and establish not only a strong corporate identity, but we also formed our own brand to seperate ourselves clearly with the competition. You can 100% sure that every ZUME juice is providing you with just that - 100% juice. We also have a main focus of sustainability. Recycle, reuse, and reduce are the main components of how we make our products. Along with the best fruits and vegetables the worlds has to offer. When creating this stationary, the theme would follow the branding aspect of ZUME. We focused on the bold blue background and the shapes of the fruit created the pattern used on the letterhead. This stationary is the example of how our branding should be used for any of our products. At ZUME, we believe that our labels would need to stand out from the competition. We wanted to match the color of our juices to the label as a way to bring attention primarily to the healthy ingredients that make up the juices we offer. The labels would share a strong emphasis using bold typography, which created a clear difference with the rest of the competition. 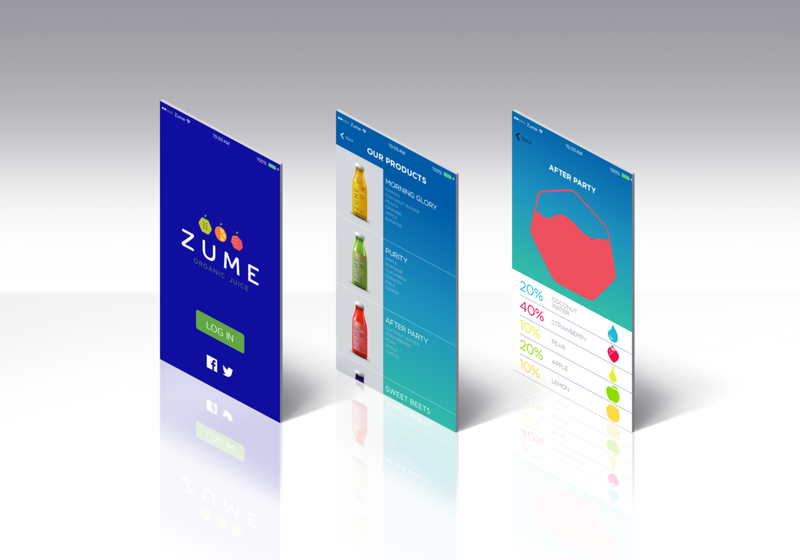 Our ZUME app was created to provide information to all of our customers. A clear interface directs our clients through the various drink options that we offer. It also allows users to create their own juices to share with the rest of the ZUME community through various social media platforms.